we just got ella about a week ago, and she is now 9 weeks......we love her so much already, though we often call her the beast because she has a tendency to be incredibly hyper (and we pretty much have played with her every waking moment so there's definitely no lack of attention). She also tends to chew everything in sight (we're working on it). We're still house-training her of course and she's got the #1s down, but #2 is a whole different story (she doesn't believe in pee pads!). Thank you for this wonderful website - we refer to it daily!!! Ella is doing very well!!! She now knows how to pee and poop outside (she LOVES chicken so we taught her how to poop based on that! ), but she doesn't know how to tell us when she needs to go (we go on scheduled breaks), so we're gonna work on the bell method! We enrolled her in puppy classes and she had her first class on sunday! She's so shy - she and a bernese mountain puppy about 4x her size hid under the chairs during puppy playtime. She runs away anytime a puppy or another dog approaches her - she's not AS shy around people at least, but she still needs work on socialization! Simply, simply adorable. 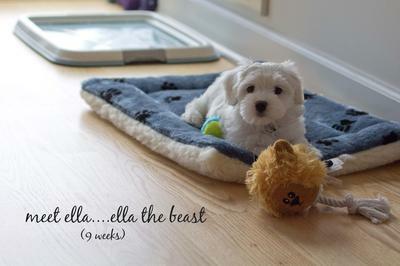 It is always so nice to wake up, open email & see a picture of a little baby puppy Coton. Thank u for sharing & I am looking forward to seeing more Oh look at my puppy pictures. Their is also a very cute & funny website u can post pictures on & feel better at the innocent Coton antics. Pictures are updated daily by dog owners & what they may find when they come home. Hi Ella sounds like Tuffy, They really need a good long walk (or two) every day to get that hyper energy decreased. I know from experience with my Coton Tuffy, and other dogs I've had, They will not choose to go pee/poop near the area they eat or sleep (neither would I.). Because of my recent surgeries I am not able to take Tuffy out as often as he needs to go.I had to re-train him with the pee pads, something he is barely tolerating as a big boy of 4 yrs' old. I keep the pee pad close to the door where we go out and Tuffy will go on it in the middle of the night sometimes, but he will usually hold everything in and wake me early to take him outside to go. When Tuffy was a very young puppy, before I could take him outdoors to go for a walk, I would put a harness and leash on him and run up and down the apartment house hallway with him saying "walkies"he loves to run! .LOL I am crazy about my dog, and just plain crazy anyway. Have fun with Ella. You are so cute Ella. It can be a trying process getting thru the training part but oh so worth it. Congrats on your beautiful little girl and do not get discouraged. For me we had good days and some days are discouraging but one day it will just click in their mind and they will learn the rules of the house. Enjoy and love her. She looks so precious! Ella looks my Tica. My Tica is a four month Coton and she is at my home for just a month. Now I'm facing the same problems as you. I don 't believe in crate and I live in a apartment. Tica's vet didn't allowed her to go out until all vacination will be done. So,I' m doing the following : when pee is ok,Tica wins a little slice of carrot. When poo is ok, she wins a little slice of apple. It is working well. Good luck and best regards!!! Ella reminds me of our little guy who is now 2.5 yrs. and yes, I spent just about every hour of the day with him. Chewing is what they do now - anything - shoes, their toys, anything - and that goes on until they loose their baby teeth. Re/the training, I thought it was going to be the end of me UNTIL I got rid of those pee pads and just started taking him out at regular intervals. We use small treats at the reward and to this day, he still counts on them! Hang in their and just enjoy the ride and esp. the times when she's sleeping - it's SO worth it. First of all congratulations on your little Ella she is adorable! Yes I hear you house breaking a Coton is a very challenging experience. What worked for us was a bit unusual first of all we do not believe in crate training. We simply started Della on a schedule every time she ate or drank anything 15 mins later it was time to go outside. We used a clicker and every time she did her business outside we clicked and gave her a treat. She caught on quite fast and the next thing we worked on was bell training. She learned how to ring the bell when she wanted outside within the first week she had it all down. Now she rings the bell whenever she wants out even just to bark it is a bit frustrating but we found if we don't let her out she will eliminate elsewhere. Patience is key and never make contact with the dog when cleaning up a mess in the house just clean it up quickly and put her outside. Soon she will learn where to go and where not to go good luck!